A cliche dating profile thing to say you "like" but if you're getting married on or near the beach or if you live near the beach and visit often, taking a long walk on the beach might be the perfect engagement shoot for you. 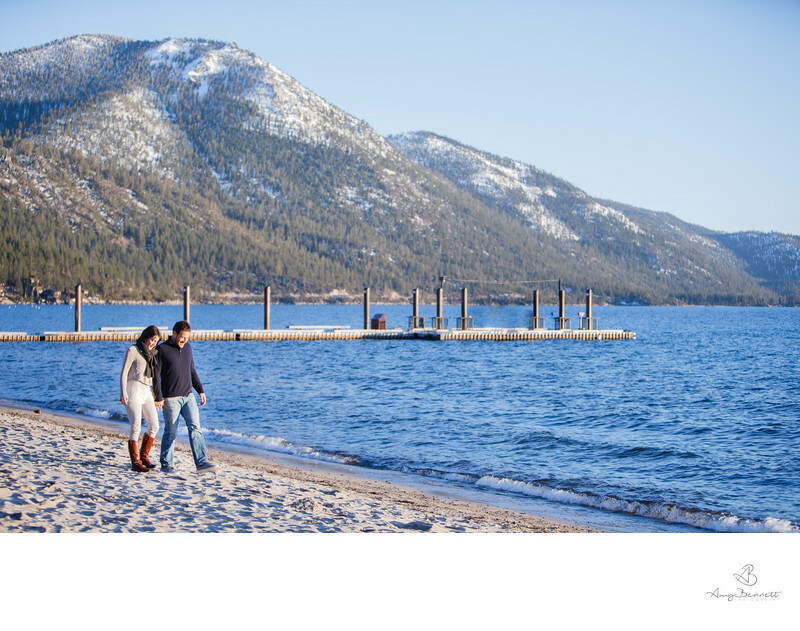 This shoot took place in beautiful Lake Tahoe, California which was my home between Cabo and moving back to my home state of Vermont. I loved living in California and am always looking for excuses to go back and visit. Of course I also love to discover a place through the eyes of someone else who lives there. I often ask couples if they want to go to their special place for their engagement shoot. It doesn't matter if I've heard of it or if I've shot there before; I have the tools and resources (hello Google Earth!) to adapt my photography to all sorts of different locations. Besides, there are only so many different types of locations and at this point, I'm confident that I have experience with most, if not all, of them. I've done lots of waterfront engagement photography in Vermont by Lake Champlain and in Cabo and California on various beaches. I've done engagement shoots in urban locations whether in small cities like Burlington Vermont or much larger cities like New York, New York. I've shot engagement photos of couples at their old haunts: college campuses, fraternities, bars they used to frequent. Taking the time to do a photoshoot like this is an opportunity and you get to decide what you want to do with it. Many couples like to take the opportunity to visit their wedding venue and do their engagement shoot in the same place that they'll be getting married. This is extra practice for all 3 of us--you'll learn where to stand and where not to stand, how to deal with the light or lack of light at your venue and I'll learn where the best spots are for your first look and portrait session(s). Of course, if you're getting married in Vermont or New England, the weather will almost definitely be different on the day of your engagement shoot from the day you've chosen for your wedding, so we won't be able to practice for all photography factors just by being at the venue. Vermont and New England have tons of other great locations for engagement photography like farms and museums. Check out my top recommendations here.